with positive thoughts, your life will start to change. Recently I wrote an article for Modern Creative Life entitled Delilah. Delilah is the name I gave my inner critic – that harsh voice that repeatedly tells me I’m not good enough, smart enough, pretty enough, popular enough… well, you get the idea. Delilah has been a faithful companion since high school, although I have a feeling she’s been with me longer than that. She just maintained a lower profile. Our relationship began when my junior high friends rejected me when we entered high school. I was hurt, confused and alone. Delilah came to my rescue. She taught me to be cautious and reserved when entering new relationships. She did not want to see me hurt again. And I was grateful for her guidance. But over time Delilah’s sweet voice of concern became harsh and critical. She no longer needed to protect me from friendships – I built strong defensive walls on my own. So instead she sought to keep me humble. Don’t be over-confident she warned. Don’t think too much of yourself she chastised. And I willingly listened. I accepted her lies as truth, and my self-esteem evaporated. Impostor Syndrome: the inability of an individual to internalize his or her accomplishments, despite evidence of competence. It is accompanied by a persistent fear of being exposed as a fraud. Proof of success is often dismissed as pure luck or some other outside factor. For decades, I thought humility was downplaying (or rejecting) any potential accomplishments. Instead, I’m learning true humility is self-acceptance – learning to use God-given strengths to become the person I’m meant to be. 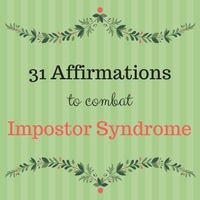 This month I am on a quest to combat Impostor Syndrome with positive affirmations. Each day I will share a bit of my struggle and then counter Delilah’s verbal attacks with one popular quote as well as one scripture verse. Delilah has been with me for decades. I do not expect her to give up easily. But I do believe these daily affirmations will be appropriate baby steps toward healing. what God’s will is – his good, pleasing and perfect will. Anne Lamott: Perfectionism is the voice of the oppressor, the enemy of the people. It will keep you cramped and insane your whole life. James 3:17: The wisdom from above is first pure, then peaceable, gentle, open to reason, full of mercy and good fruits, impartial and sincere. Brene Brown: Perfectionism is a twenty-two ton shield that we lug around thinking it will protect us when, in fact, it’s the thing that is really preventing us from taking flight. Galatians 5:22-23: But the fruit of the spirit is love, joy, peace, patience, kindness, goodness, faithfulness, gentleness, and self-control. Julia Cameron: Perfectionism is not the quest for the best. It is the pursuit of the worst in ourselves, the part that tells us nothing we do is good enough. J. K. Rowling: Perfection is not necessary to make a real and lasting difference in other people’s lives. Ecclesiastes 3:13: That each of them may eat and drink, and find satisfaction in their toil – this is the gift of God. Danielle LaPorte: Fear can show up as a perfectionist. 2 Timothy 1:7: For God gave us a spirit not of fear but of power and love and self-control. Rick Warren: If you live for the approval of others, you will die by their rejection. Psalm 118:6: The Lord is on my side; I will not fear. What can man do to me? Matthew 22:37-39: Love the Lord your God with all your heart, with all your soul, and with all your mind. This is the first and greatest commandment. And the second is like it: love your neighbor as yourself. Luke 6:37: Judge not and you will not be judged; condemn not and you will not be condemned; forgive and you will be forgiven. Galatians 1:10: Am I now trying to win the approval of human beings or of God? Or am I trying to please people? If I were still trying to please people, I would not be a servant of Jesus Christ. Arthur Ashe: Start where you are – Use what you have – Do what you can. Colossians 3:23: Whatever you do, work heartedly as for the Lord and not for men. Albert Einstein: If you judge a fish by its ability to climb a tree, it will live its whole life believing that it is stupid. Ephesians 2:10: For we are God’s handiwork, created in Jesus Christ to do good works, which God prepared in advance for us to do. Zen Shin: A flower does not think of competing to the flower next to it, it just blooms. Galatians 6:4: Each one should test their own actions. Then they can take pride in themselves alone, without comparing themselves to someone else. Psalm 37:7: Be still before the Lord and wait patiently for him. Fret not yourself over the one who prospers in his way. John 15:12: This is my commandment: Love others as I have loved you. Matty Mullins: The only person you should try to be better than, is the person you were yesterday. 1 Corinthians 9:24, 26-27: Do you not know that in a race, all runners run, but only one receives the prize? So run that you may obtain it. I do not run aimlessly; I do not box as one beating the air. But I discipline my body and keep it under control. Denis Waitley: It’s not what you are that holds you back, it’s what you think you are not. Proverbs 27:2: Let someone else praise you, and not your own mouth. Henry David Thoreau: If a man does not keep pace with his companions, perhaps it is because he hears a different drummer. Let him step to the music which he hears, however measured or however far away. Philippians 3:13-14: But one thing I do: forgetting what lies behind and straining forward to what lies ahead, I press on toward the goal for the prize of the upward call of God in Christ Jesus. Christopher Reeve: Either we let self-doubt and feelings of inadequacy prevent us from realizing our potential, or embrace the fact that when we turn our attention away from ourselves, our potential is limitless. Hebrews 2:1b: … let us run with endurance the race set before us. Pablo Picasso: The meaning of life is to find your gift; the purpose of life is to give it away. Dwight Eisenhower: Plans are useless, but planning is indispensable. Proverbs 19:21: Many are the plans in the mind of man, but it is the purpose of the Lord that will stand. Antoine de Saint-Exupery: A goal without a plan is just a wish. Benjamin Franklin: By failing to prepare, you are preparing to fail. Proverbs 16:9: The heart of a man plans his way, but the Lord establishes his steps. Martin Luther King, Jr: You don’t have to see the whole staircase, just take the first step. Psalm 37:23: The steps of a man are established by the Lord, when he delights in his own way. Michael J. Fox: I am careful not to confuse excellence with perfection. Excellence I can reach for; perfection is God’s business. Philippians 2:3: Do nothing from selfish ambition or conceit; but in humility count others more significant than yourself. Helen Keller: Be happy with what you have while working for what you want. Philippians 4:11-12: … I have learned to be content whatever the circumstances. I know what it is to be in need, and I know what it is to have plenty. I have learned the secret of being content in any and every situation, whether well-fed or hungry, whether living in plenty or in want. Walt Disney: A dream is a wish your heart makes. Psalm 20:4: May he grant your heart’s desire and fulfill all your plans. William Shakespeare: Our doubts are traitors, and make us lose the good we oft might win, by fearing to attempt. Galatians 6:9: Let us not grow weary of doing good, for in due season we will reap, if we do not give up. C. S. Lewis: You are never too old to set another goal, or to dream a new dream. John Wayne: Courage is being scared to death and saddling up anyway. 2 Corinthians 12:9: My grace is sufficient for you, for my power is made perfect in your weakness. e.e. cummings: It takes courage to grow up and become who you really are. Romans 12:3: Do not think of yourself more highly than you ought, but rather think of yourself with sober judgment, in accordance with the faith God has distributed to each of you. Joseph Campbell: The privilege of a lifetime is being who you are. Matthew 23:12 (MSG): But if you are content to simply be yourself, your life will count for plenty. I have been reading about the Jezebel spirit, I wrote about a post about it, and eve one about Delilah, funny how the devils uses old spiritual influences to keep us from seeing what God sees in us. I'm doing Angels this year, your neighbor from 31 Days. My mom used to collect angels. I will definitely follow your series this month.